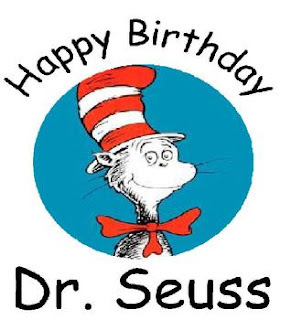 Missys Product Reviews : Happy BIrthday Dr. Seuss! March 2nd is Dr. Seuss’s birthday what better way to celebrate than to read? Did you know Dr. Seuss would be 113 this year? While he is no longer with us, his legacy lives on in the pages of his books. He forever changed the way children’s books were written and continues to inspire generations. This luscious, velvety hat is for eating, not wearing! Wash fruits, let dry, then coarsely chop. In each glass, alternate layers of vanilla yogurt with your favorite fresh red berries or cherries, creating the red and white stripes of the Cat’s hat. To keep the yogurt from smearing, use a decorating bag (or plastic sandwich bag with the corner cut off) to fill the glasses. Depending on availability and tastes, you could also make parfaits using pureed frozen fruits thickened with a little cornstarch or canned cherry pie filling and vanilla ice cream. Top off these toppers with a dollop of whipped cream and dig in! Labels: Happy BIrthday Dr. Seuss!